The first Gutenberg bible was completed in 1455. Thus in roughly fifty years printing spread over Europe, in less than a hundred across the continents. We may now be in an analogous process whereby the book migrates from printed pages to electronic storage and transmission—and the process is likely to take places much faster than the spread of movable type. Manguel points out elsewhere in this chapter that printed books did not replace hand-written volumes. Indeed some of the more beautiful such volumes were created in this period. But ultimately calligraphed books disappeared from commerce altogether. 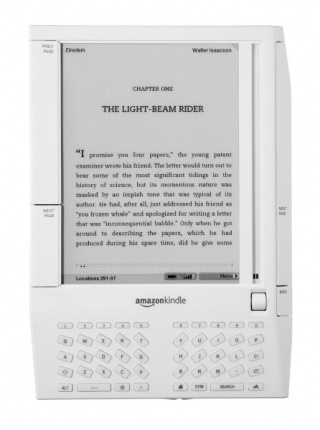 Is that likely to happen to the printed book in the turbulent wake now beginning to rise from the Kindle? In a way we hope that printed and electronic books will both continue side by side into the distant future—if for no other reason than to guarantee the preservation of knowledge. The big difference between these two forms of the book is that printed products will survive any kind of major technological meltdown which deprives large areas of electricity for extended periods of time. Bad things do happen. If they were to happen in some future time when books are no longer printed (thinking now in a science fiction mode), humanity might not only lose much practical knowledge but may have to recover from a few ancient volumes the wisdom of the ages—and may have to reinvent movable type all over again. In the eight short pages “Of Time and Third Avenue” Alfred Bester takes a classic time-travel conundrum, adds several sharp dashes of philosophy, then tops the temporal cocktail a clever twist at the end. The characters are only briefly sketched, the plot is nearly nonexistent, but the philosophical questions about time travel are … um … um, timeless? Hmmn … that can’t possibly have been the word I wanted there. But the story’s a good, quick read. Check it out. “Of Time and Third Avenue” (1951) by Alfred Bester appears in The Very Best of Fantasy & Science Fiction, from Tachyon Publications. The recent news story on the resignation of Ron Marshall, CEO of the Borders Group (the NYT story is here), suggests that this major retailer had and still is having troubles. Marshall, who just arrived at Borders a year ago, did what turn-around experts do best. He cut costs and eliminated many of the smaller and less profitable Borders outlets. Evidently not enough. How big is book retailing? Manufacturing and Distribution USA (one of our books) tells us that the industry (technically NAICS 451211 – Book Stores) had nearly 10,600 establishments in 2009, sold $19.9 billion in merchandise (not all of that books), about $1.8 million per establishment. This sector also employed nearly 162,000 people. Establishment counts are down from 11,700 in 1990 but employment is up from the 86,000 in that year—suggesting that in this period stores have become bigger. Ron Marshall was just following a trend. This period also saw the rise, from a flat horizon, of a giant, Amazon.com. Amazon’s sales (per its most recent 10K filing with the SEC) had net sales in 2009 of $24.5 billion—up from $8.5 billion in 2005: that’s growth, folks). Borders Group? $2.63 billion, up from $2.59 billion in 2005. Barnes & Noble? $4.53 billion (2008), up from $4.12 billion (2004). There are also other smaller chains. Dictionaries being very much in the news these days (see this story, for example), it occurred to us to remember the Akkadians who came to prominence in Southern Mesopotamia 4360 years ago, i.e., in 2350 BC. The Akkadian civilization lasted for about 125 years, but it was an age of sudden cultural florescence. Today we call this region Iraq writ large, thus the basin of the Tigris and Euphrates, rivers that nourished the earliest civilizations and then, as now, fed the Persian Gulf. But what is the connection here? The connection is that the earliest known dictionaries ever used arose during the Akkadian empire in the form of cuneiform tablets showing Akkadian and Sumerian words side by side. The illustration above shows Mesopotamian writing. The dictionary therefore goes back a right respectable number of years. Neither the banning of dictionaries here and there—nor the burning of books generally—ever succeeds. Reference publishers instantly rise from their ashes. They set to work rebuilding whatever Libraries of Alexandria beady-eyed ignorance has happened last to burn—and to fill them with treasures that enlighten all eager readers searching for just the right word. The most popular flavors on offer at the recent ConFusion we attended (Fem Fantasy Fatal Lite, Green Goth Mint, Vampire Vanilla, Zombie Zabaione) made us wonder exactly how the famous split between fantasy and science fiction actually fared in the publishing environment. Locus Online to the rescue. 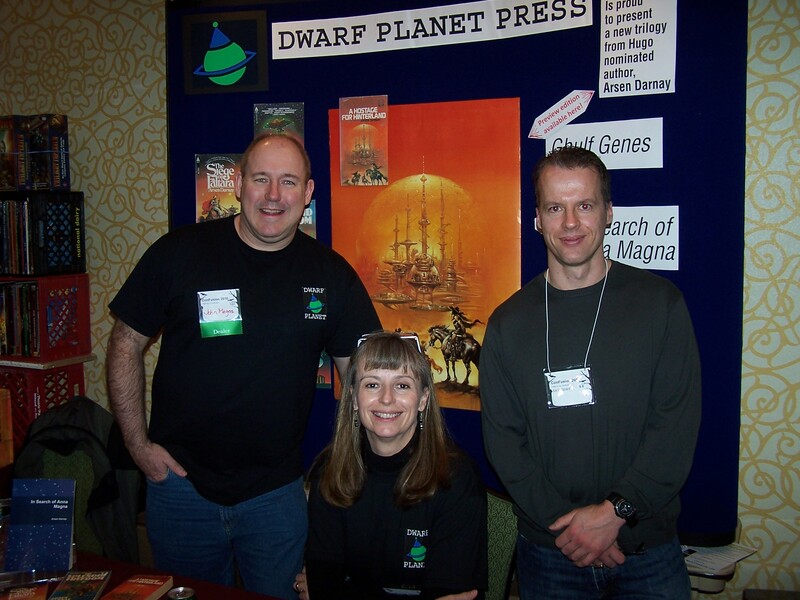 Locus Online is the website that tracks the field for The Magazine of the Science Fiction & Fantasy. It provides some rich materials for understanding this segment of the fiction market in its two incarnations. The Locus website is here—recommended for those aspiring to understand the field. 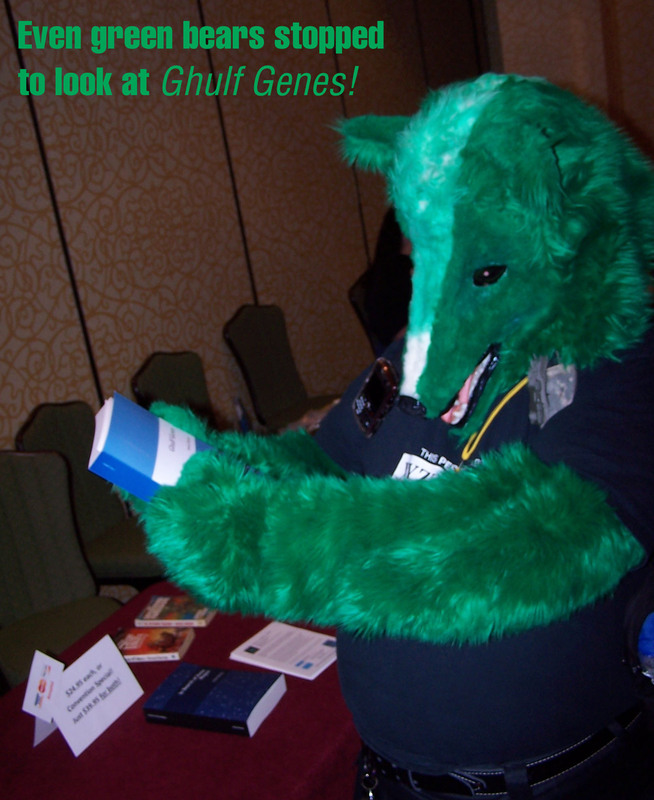 Locus Online also maintains The Locus Index to Science Fiction. We give this link to its 1999 page—at the bottom of which the visitor can also summon other years for a closer look. One of the features of this Index is statistics on books and magazines published by sub-segments of the F&SF category. The data that follow show the number of books issued for the period 1984 through 2007. Only a single total is available for the 1984-1998 years. We show an average per year for that period. In all other years, actual data obtained by Locus Online are cited in the graphic. The site does not explain the rather sharp rise between 2000 and 2001; that may be due to better sampling or may represent an upsurge in interest. 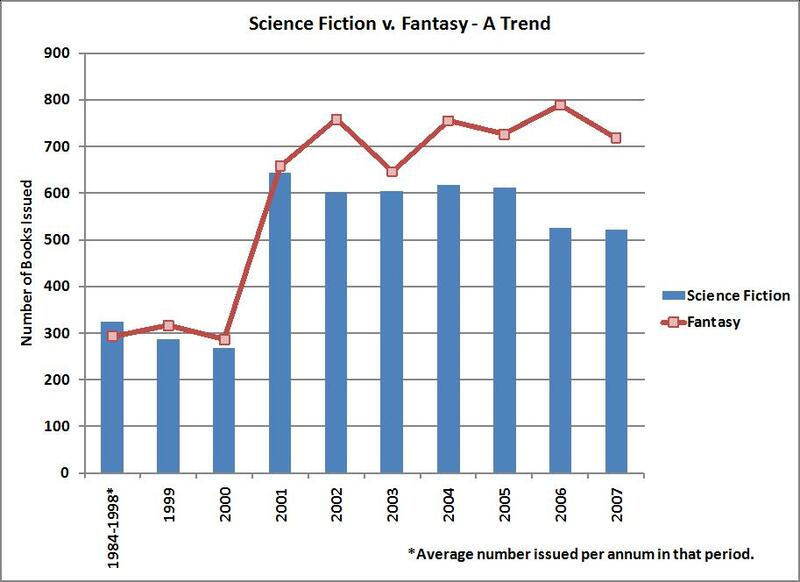 The graph shows that “in the olden days” (1984-1998) Science Fiction was still King—though hard pressed by the upstart Duke of Fantasy. Thereafter Fantasy becomes the ruler, and an increasing distance opens between science fiction and fantasy. At the risk of over-stating what a few years’ trend may mean, the data suggest that the audience, the tastes, or the culture may be changing—maybe all three. The core of science fiction is physicalist realism—but refreshed by the assumption that science will bring radical change. At the core of fantasy is a kind of suspension of disbelief and–we submit–a kind of nostalgia for archaic images, emotions. Science fiction opens vast horizons for sociological, fantasy for supernatural speculation. In the first we are invited to contemplate the laws of nature, in the other the meaning of symbols. One’s tempted to wonder: is the dream of barbarism (Conan), of magic kingdoms (Tolkien), of dazzling fairies and of horrid monsters deepening? Is that what we’re seeing? Plastics and microwave ovens no longer inspiring perhaps? Nothing to dream about? Food for thought. Let’s have another dip of that stuff to see if the taste’s improving. We spent the weekend in Troy Michigan, at the ConFusion Convention. We’re still upacking, scribbling rapidly on our new To Do list, and digesting what we learned. We met a lot of fascinating people, we heard a lot of great stories, we saw characters from many eras and locations, and we even saw a wedding. A full weekend, indeed. 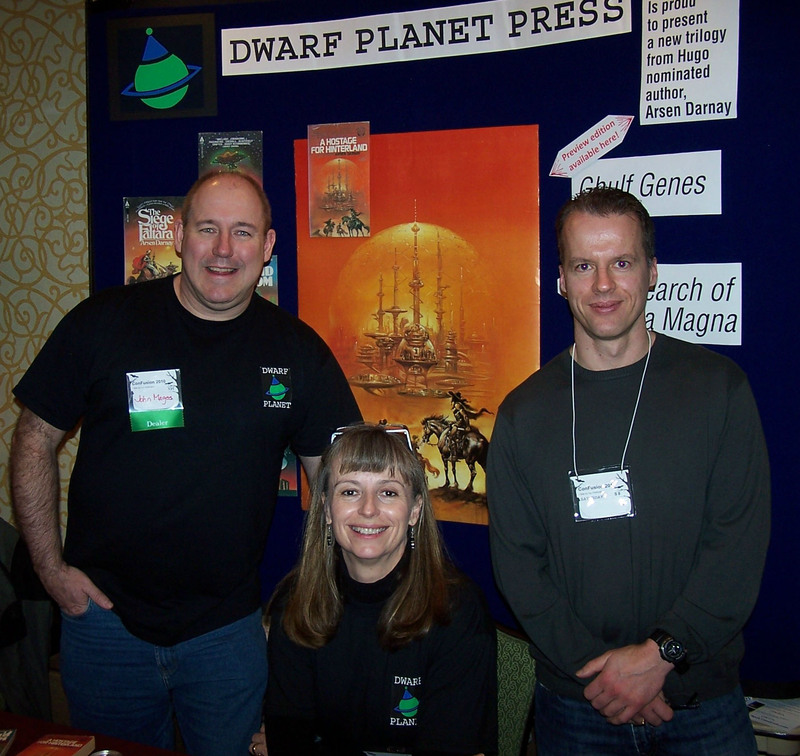 Then, we put our heads together and came up with some fun new ideas for making the launch of Dwarf Planet Press even better! Thanks to all those who shared their observations, insights and experiences. For us, ConFusion led to… greater clarity.